Starting with the current post, I thought I would do a mini-series on how the "old-time" bodybuilders used to train. In doing so, I also thought I would start with what I consider the greatest of the old-time mass tactics: one-exercise-per-bodypart training. When I first began to lift weights seriously (which was sometime in my high-school years; I'm 35 now, so you do the math), the bodybuilders that I loved were the ones that—even then—were considered the "old-timers." I remember seeing pictures of Freddy Ortiz, Don Howorth (above), and Marvin Eder; I was amazed by their look. For one, they definitely looked strong (which they were), but they also had excellent size, shape, and symmetry—small waists, large calves, boulder-sized shoulders; the whole "x-frame" look. But—and I think this is what I still love about them—they didn't appear to be cardboard cutouts of one another. They all had different "looks." They were shapely and symmetrical, sure, but they were also their own men. 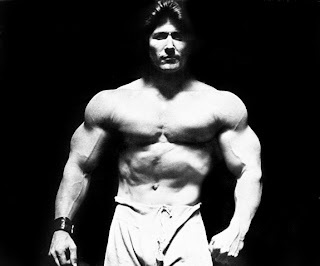 You just don't see that kind of unique-ness in today's bodybuilding world. One of the most common training techniques that the old-timers used was "one-exercise-per-bodypart" training. If they didn't utilize one exercise for each bodypart, then they rarely used more than two. 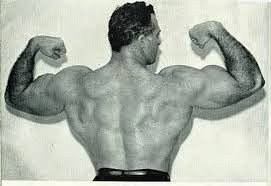 I remember reading an article by Reg Park—another of the greats—where he said that he never did more than two-exercises per muscle group in the off-season. He saved all the pumping, toning, multi-angular stuff with a lot of exercises for the weeks before a bodybuilding contest. This kind of training has several benefits. The first is its simplicity. You just take an exercise and bang away at it until you either 1) perform your desired number of sets, or 2) get the desired "pump" in the muscle group(s) you are training. Another factor is that it allows you to get such a good pump. I'm afraid that "pump" training has got a bit of a bad rap in some articles as of late—even in two of my favorite sites: T-Nation and Dragon Door. I understand the grumbling. You shouldn't train solely for the pump, especially if you are using weights that are too light or if you haven't established a firm base of muscle through heavy, basic training. However, if you are training with the appropriate amount of weight, then the pump is a pretty good indicator of muscle growth. It's definitely the measurement indicator-of-choice that the old-timers used in order to assess whether or not they were getting a good workout. And one-exercise-per-bodypart training definitely allows you to get a better pump than other training methods. In fact, how many times have you been training on an exercise, getting a good pump, and then you begin to lose your pump when you switch to another movement? If you're like me, then the answer is more times than you can count. But you don't have that problem with one-exercise-per-bodypart training. When you first begin with this kind of training, I recommend sticking with a pre-planned set/rep format. The most common—and the ones I am going to recommend—would either be a 6 sets of 6 format, an 8 sets of 8 format, or a 10 sets of 10 regimen. If you are already an advanced lifter, then you might want to consider a "wave-loading" pattern, as well. For this, you would start your first workout with 10 sets of 5, the next workout would be 10 sets of 4, and the third workout would be 10 sets of 3. With each workout, you would—of course—add weight. When beginning, however, use one of the first three set/rep options. For each muscle group, pick 3 or 4 exercises that are effective—for you—at building up that particular muscle group. Rotate exercises every 2 to 3 workouts. On Thursday, you would take the day off. If you feel well rested on Friday, then repeat the cycle. If not, then wait 'til Saturday before starting it over again. Use the same exercises for your next three days of training before swapping to a new set of exercises on the following 3-day split. Just had one question. I have been weight lifting for a few months now. I have found it most effective (for me) to do upper body weights 3 days a week, and lower body weights 3 days a week (alternating days) then resting on Sunday. I have also found it effective to only do ONE exercise (with desired weight, sets, and reps) per muscle group. For example, for the biceps I perform X sets of X reps at X weight every other day. I have done this for each muscle I want to improve, and it's worked amazingly. Here's my question(s): There are a few weight lifting activities that work certain muscle groups, but I am unsure of which activities work which muscles. Please tell me which muscle is (mainly) worked when you have 2 dumbells, holding one in each fist at shoulder level, lifting them both up simultaneously (touching or almost touching them at the top above your head) then bringing them back down to shoulder level. What is the primary purpose of that activity? Also, standing straight up with a barbell in hands, at chest level, and pushing straight up (extending hands fully) then bringing the barbell back down to chest level (then obviously repeating it for desired reps & sets). What muscle does that primarily target? Thank you very much for your help. I really liked your article and your explanation of the training, thanks!